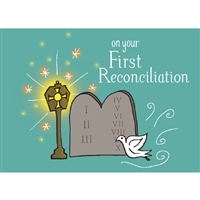 Celebrate reconciliation with God and neighbor with the familiar imagery of the Ten Commandments. The tablets are illuminated by a lantern/monstrance in a playful sketch by Elisa Armstrong. The other half of the salutation "May reconciliation with God make you shine like the sun" came from two parts in Scripture - both included on the back of the card. Moses' face radiated after God gave him the 10 commandments. Also, in Matthew, it says that "the righteous will shine like the sun."